This program introduces children to basic gymnastics skills and coordination tasks on various gymnastics equipment. The emphasis of the program is encouraging children to try new skills, positively reinforcing the attempts, fostering a positive attitude toward new situations and promoting physical activity. In our program, children can have fun while they develop coordination, balance, gymnastics skills, and self confidence. The 2.5 year olds are required to bring a grown-up with them to class. The class times are divided by age. Students should register for their current age group. All of the classes are similar in content, but vary in approach and expectations. 3 year-olds uncomfortable with parent separation are welcome in 2.5 year old classes as well as children of all abilities whose special needs require their grown-up’s personal spotting for a safe and successful experience at Gymkhana. All students must be 3 years old, ready to separate from their grown-ups, and fully potty-trained in order to enter a 3-year-old class. 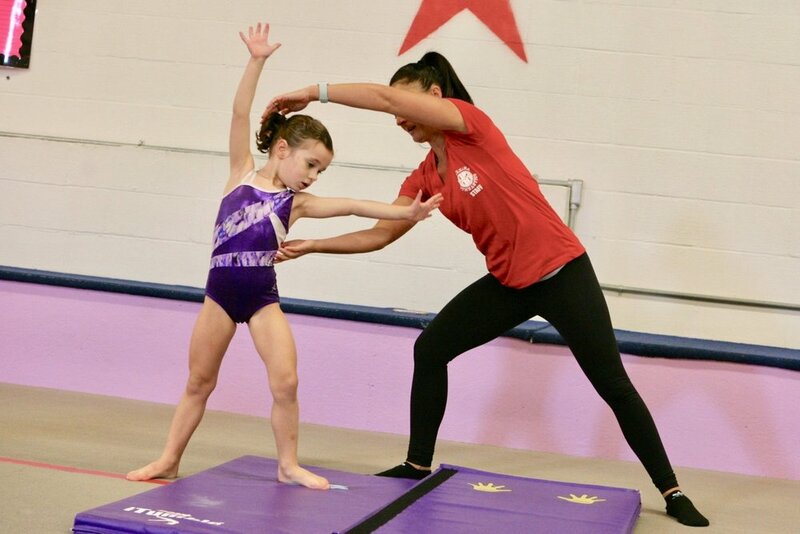 These classes include instruction on basic gymnastics skills for a new beginner as well as a continuing student at the beginner or intermediate level. Children are evaluated and placed into the appropriate age and ability groups within their class times. Students may move from one level to the next by passing skill requirements. All intermediate-level girls have the opportunity to continue their training two days per week on a non-travel team that competes in inter-squad competitions with other Gymkhana locations. Spaces are limited. These classes are for girls and boys interested in tumbling. Students will be taught using the trampolines and floor exercise mats. All skills are directly applicable to cheerleading. Age and skill requirements vary by location.